The discus throw had its origins as a sport at the ancient Greek Olympics. The ancient discus looked a lot like the ones used today. Originally carved from stone, the discus was later made of bronze, iron or lead. The modern discus has a metal core and rim and the sides are typically plastic. 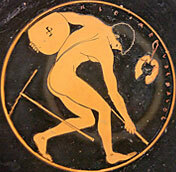 The technique used to throw a discus at the ancient Olympics is much the same as it is today. 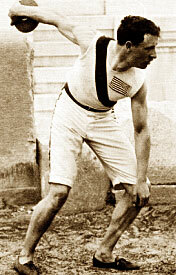 The discus throw became a modern event when it was introduced at the 1896 Olympics in Athens. It continues to an event in the modern Olympic games. For men’rsquo;s competition, the discus weighs 4 lbs. 7 oz., with a diameter of 8.6 inches. To throw, the competitor starts in a circle that is 8 feet 2.5 inches in diameter. Usually, the thrower begins by facing away from the direction of the throw. He then quickly spins around 1.5 times, buildiing momentum, then releases his throw. The distance from the front edge of the circle to the landing point of the discus is measured. The discus throw is difficult to master. It requires strong arms and legs, agility, balance and timing. The mechanics of the discus throw are intricate and it typically takes serveral years to master.